The ad tech industry’s move towards first-price auctions can lead to rising eCPMs as buyers risk overpaying for impressions resulting in decreasing returns on their ad spend. So how can buyers know what is an appropriate first-price bid? 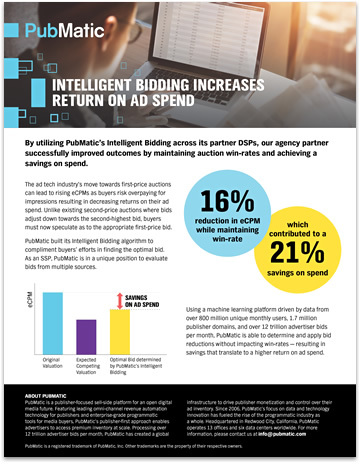 By utilizing Intelligent Bidding across its partner DSPs, our agency partner successfully improved outcomes by maintaining auction win-rates and achieving a savings on spend. Learn how PubMatic’s Intelligent Bidding algorithm can help buyers increase return-on-ad-spend, and improve bids, in this case study.